The objective from the viewpoint of Bank customers. The bank is a financial institution or corporation which deals with money and its substitutes; it also provides other financial services. 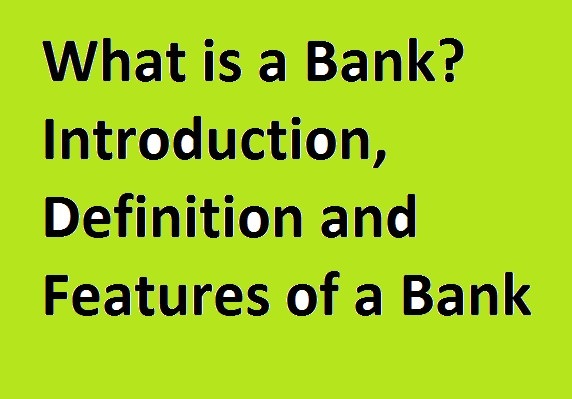 Banks accept deposits and make loans and obtain a profit from the difference in the interest paid to lenders (depositors) and charged to borrowers, respectively. It is formed for the purposes of maintaining current accounts, savings accounts and checking accounts, issuing loans or advances or investment (Islamic mode) and credit, and dealing in negotiable securities issued by governmental entities and corporations. It makes a link with depositors and customers directly or indirectly. Crowther says “A bank is a dealer in debts- his own and other peoples”. R.P. Kent says “A bank is an institution, the principal function of which is collect the unutilized money of the people and to lend it to others.”. “A bank is an institution for the custody and investment of money. 2) “ A bank, it implied, is an instrument of society having functions what make it, in effect, a financial reservoir receiving streams of currency from any direction and from which their issue out following streams where and as required to sustain and fructify or assist commercial, industrial or other enterprises or ventures.”- The high court of Australia. 2) “Stated very simple, banks deals in money and in that connection offer certain related financial services.” – Harold Wallgren for American Bankers Association. 3) The objective from the viewpoint of Bank customers. i) Earning profit: Profit motive of the owners of the Bank acts as a driving force in engaging themselves in the business of banking like all other business. ii) Rendering Services: Bank renders various services to society as a part of their social commitment and this is a prime objective for engaging in the banking business. Bankers are not only to make the profit but also to do some good for the society. iii) Investment of fund: The owners of the bank treat the bank as a suitable sector to invest their accumulated saved money. iv) Earning goodwill: The owners of the bank take a bank as a way of earning goodwill by enhancing the periphery of their banking business. v) Raising efficiency: The owners sharpen their managerial skill and efficiency by ensuring the smooth operation of their banking business. i) Issuance of Note and currency notes: Government issues notes and currency as a medium of exchange through banks. ii)Formation of capital: Government always encourages the formation of capital in society through households and bank act as a catalyzing force in the formation of capital in different sectors of the society. iii) Investment of capital and industrialization: Bank helps investment of ideal money through its various asset products and expedites industrialization. Eventually, this helps the growth of GDP, alleviating poverty and ensures equal distribution of wealth. iv) Control of money market: Bank by its various products help in controlling money market (supply of money in the market) and guards against the economy to be inflated. v) Creation of employment: Bank to fulfill its human resource requirements and create large employment opportunities. i) Safe custodian of public money: Bank acts as a safe custodian of public money. By depositing own money into a Bank account people get rid of worries like theft, burglary, and snatching. ii)Custodian of public money: Sometimes the bank acts as a financial adviser and counselor to its customers in various aspects. iii) Representative or trustee: Bank sometimes performs the role of a representative or trustee on behalf of its customers. iv)Providing credit facility: Bank provides credit facility to its customers and make opportunities to invest in the profitable sector and by the process create income opportunities for customers.